A 15-year-old boy has surrendered to authorities in India, after allegedly performing a Caesarean section to set a record as the world's youngest surgeon. Police had sought Dileepan Raj since arresting his parents on 25 June in the southern state of Tamil Nadu. The parents of the teenager, who are both doctors, allegedly supervised the operation on a 20-year-old pregnant woman. They are awaiting trial. The couple face several charges, including endangering human life. Police said Dileepan Raj had handed himself in at the juvenile justice court and that they were seeking authorisation to hold him for questioning. It is not clear if he too will be charged. The new mother has been identified as a relative but is said to be unwilling to press charges. The baby was reportedly born with a birth defect unrelated to the surgery. 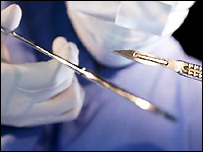 Senior medical officials in Tamil Nadu said they had been shown a recording of the surgery, which was carried out at the Mathi Surgical and Maternity Hospital, in the town of Manaparai. The video allegedly showed the boy's father administering the anaesthetic before the 15-year-old began operating, said Venkatesh Prasad of the Indian Medical Association. Mr Prasad said the boy's father had expressed a wish to see his son's name in the Guinness Book of World Records. A Guinness World Records spokeswoman said the organisation did not endorse such attempts. Police have been unable to recover the video and lawyers for the family said the boy was only helping out and did not perform the surgery. The health authorities in Tamil Nadu state have ordered an inquiry into the incident.